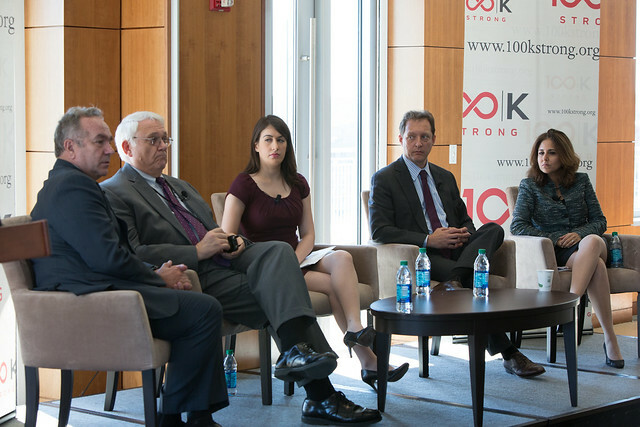 On September 15, 2015, the 100,000 Strong Foundation convened a distinguished group of policy institute leaders at the George Washington University for a lively armchair conversation about the current state of US-China relations and what we might expect from the September State Visit of Chinese President Xi Jinping to Washington. Moderated by ABC’s Ali Weinberg, the discussion featured Kurt Campbell, chairman of CNAS; John Hamre, president and CEO of CSIS; Daniel Rosen, founding partner of Rhodium Group; and Neera Tanden, president of CAP. Dr. Steven Knapp, president of The George Washington University and Chairman of the 100K Strong Academic Advisory Council, made closing remarks.